When the time comes to find in-home healthcare for yourself or a loved one, paying for these important services is probably the last thing on your mind. After all, it’s hard enough having to find a perfectly matched, capable and compassionate caregiver to meet your loved one’s changing needs. Our clients can cancel at ANY time. There are NO binding contracts that keep you locked into services with us. We stand behind our promise to give you white glove service all of the time. Care Right There Home Healthcare only asks that you let us know when you are not happy and then give us ample time to try and correct any issues before cancelling. Nevertheless, it’s important that you and your family draw up a financial plan to cover the cost of care. This helps to ensure that your loved ones are comfortable, secure and cared for as they age and that your family’s financial resources are preserved in the process. The good news is that there are a number of resources and options available to help you with that plan and we are here to help you sort it all out. Contact Us Now and Ask us about our Care Management Services! In order to help you weigh out each option and plan accordingly, we’ve compiled the following list of 5 ways to pay for typical home care needs. Of course, as with anything, there are pros and cons to consider with each option so it’s important to do as much research as possible. We have no long-term contracts. You are able to cancel services at any time with no penalties. Customer Service is our #1 Policy so your satisfaction is our guarantee. Since individuals who require non-medical in-home care are not sick in the traditional sense, regular health insurance plans do not provide care for these needs. .For those that do not have Long Term Care Insurance, private pay and creative financing may be the next logical step. Either from savings, pension, social security or family contributions, we work with the individuals we serve to formulate a plan that works for the care they need. We help guide the individual through all the options available to them including creative financing. The Veteran’s Aid & Attendance Pension Program offers families and individuals an additional method of paying for home care costs. Whether or not you or your family member qualifies for the A&A Program, the VA allows households to deduct the annual cost of paying for in–home care when calculating their regular pension benefit. This annual cost is then used to calculate the benefit based on a new “countable income” and allows families earning more than the pension benefit to receive a disability income from the VA. Care Right There Home Healthcare, LLC is in partnership with the American Veteran’s Care Connection (AVCC), which is an advocacy group that manages the application, evaluation and award process with the VA so that you don’t have to. They are highly regarded and have a reputation for getting your benefits payments faster than going directly to the VA or any other program. There are a number of options available to families with non-liquid assets that allow them to convert those assets to help cover thing like home care expenses. Reverse mortgages, Home Equity Lines of Credit, Rex Agreements and Equity Key are real estate-based asset conversion programs that provide individuals with financial solutions to their long-term home care needs. In addition to these programs, Care Right There Home Healthcare, LLC partners with Life Care Funding to convert your life insurance policy death benefits into direct payments while still potentially preserving your death benefit for your beneficiaries. Let Care Right There help you explore these options. There are a variety of state and federal programs, initiatives tax credits that can significantly lower your family’s tax burden effectively reducing the overall cost of care. There are a number of state-specific initiatives designed to help keep seniors who qualify for Medicaid out of nursing homes and living comfortably in their own homes. These programs will help to cover the cost of home care and is less than the cost of nursing homes. These programs may provide a combination of both traditional medical services (i.e. dental services, skilled nursing services) as well as non-medical services (i.e. respite, case management, and environmental modifications) to those who meet both the established clinical and financial criteria. Provide support to individuals who are reentering a community setting after a period of institutionalization. Please note that Care Right There, LLC may NOT be able to accept all of the aforementioned forms of payment at this time. 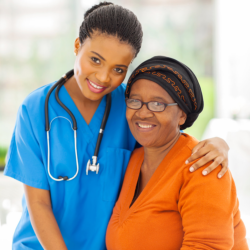 Wondering if home care is right for your loved one? Take our FREE Self Assessment or Call Us Today!